Are You Participating in MOC? Why do I have to pay fees for this program? How will the ABNM help me track the milestones for participating in MOC? What should I do if I plan to retire and will no longer participate in MOC? Do all diplomates need to participate in MOC? What are the consequences if I do not participate in MOC? Do diplomates with a lifetime certificate need to participate in MOC? How are Self-Assessment Module (SAM) credits measured? Does the ABNM count SA-CME credit? Does a journal article with CME credit, which does not state it provides SA-CME credit, count as SA-CME? Do I have to participate in MOC if I am in training? Do I have to be clinically active? How do I find a document? How do I navigate through My Profile? Why aren’t the changes I made saved? How often do I need to update My Profile? How do I pay my MOC fee? There has been no change in my Licenses. Why do I need to update Part 1? How many Category 1 CME credits am I required to have annually? Do I have to enter Category 1 CME credits manually? I do not belong to the society where I earned the CME credit; will my credits transfer through the CMEgateway? What happens if the organization I received my CME credits through does not participate in the CMEgateway? How many Category 2 CMEs are required annually? How do I fill in the fields with CME credit information? How do I see how I am doing? How do I fill in a single session? What numbers do I fill in for the different credit types? Why do I have a duplicate entry of CME credit noted in my record? I’ve made an error in entering a CME activity and have been contacted by the ABNM to revise, what should I do? How do I know when it is time for me to take the MOC exam? Is there another way the ABNM can remind me of the exam deadline? What happens if I miss the deadline and my certificate expires? If I miss the deadline will I still be able to take the exam? Can I take the exam earlier than the required 10 years? I have a lifetime certificate, will that certificate still be valid when I pass the MOC exam? MOC Part 4–Practice Performance Assessment How do I pick a Part 4 project? How do I pick a Part 4 project? Do you have any resources that will help me choose a project? What is the timeline for Part 4 projects? The MOC requirements for participation in MOC are provided on the ABNM website. This FAQ attempts to answer the most common questions about these requirements. If you have additional questions or need further clarifications, please email your questions to abnm@abnm.org. Why do I have to pay fees for this program? The MOC fee was initiated in 2006 to help pay for the start-up costs of MOC. The board does not intend to make a profit from MOC fees. In 2012, the board started to incorporate the MOC exam fees into the MOC annual fees. Since that time, the annual MOC fee has been $400. The MOC exam fee is being phased out over a period of 10 years. In order to participate in MOC, diplomates must pay the MOC. How will the ABNM help me track the milestones for participating in MOC? If you fall one year behind, every other month you will receive an e-mail message from the ABNM reminding you of milestones and/or fees that require your attention or are due. This is why it is crucial for diplomates to update their contact information, especially their e-mail address, on a regular (at least annual) basis. What should I do if I plan to retire and will no longer participate in MOC? Contact the ABNM by e-mail informing us that you will retire and have decided not to participate in MOC any longer. We will note in your profile that you have retired and you will no longer receive any information about MOC. Should your circumstances change and you will again practice, and wish to participate in MOC, contact the ABNM for information about participating (see question above about re-entry requirements). Do all diplomates need to participate in MOC? Yes. As professionals we all have a responsibility for life-long learning. MOC formalizes life-long learning and practice performance assessment (PPA) into a program that is valuable to diplomates and credible to state medical licensing boards, payers, patients, credentialing committees, etc. If boards do not take the lead in establishing a credible program, alternative programs will inevitably be imposed on medical professionals by others. The American Board of Medical Specialties (ABMS) is coordinating the efforts of all 24 member boards. What are the consequences if I do not participate in MOC? Over the next few years, it is likely that other groups will require ABNM diplomates to participate in MOC. Failure to participate may result in increased difficulty in renewing your medical license, being credentialed, or being reimbursed by the government and 3rd party payers. Candidates taking the certification examination and diplomates with time limited certificates taking the MOC examination now sign a statement acknowledging that they must participate in MOC in order to maintain their certificate. Lifetime certificates will not be converted to time-limited certificates when diplomates participate in MOC. In August 2011, the ABMS (American Board of Medical Specialties) began posting diplomates MOC status on their public website (www.certificationmatters.org). The milestones that the ABNM will be using to determine MOC status are posted on the ABNM website. Do diplomates with a lifetime certificate need to participate in MOC? Yes, it is illogical to require younger, more recently trained physicians to participate in MOC and not require older physicians to participate. There is some evidence to indicate that older physicians will benefit more from MOC. Failure to participate will likely result in increased difficulty in renewing your medical license, being credentialed, and being reimbursed by the government and 3rd party payers. Although diplomates with a lifetime certificate are expected to participate in MOC, the ABNM will not revoke their certificates if they do not participate. How are Self-Assessment Module (SAM) credits measured? Each self-assessment module is assigned a number of CME credits. The ABNM uses these CME credits to measure self-assessment. A single module with 2.5 CME credits receives 2.5 credits toward the 8.0 self-assessment credit requirement. Does the ABNM count SA-CME credit? Yes, the ABNM counts self-assessment CME (SA-CME) credits toward the self-assessment requirement. SA-CME credits are type 2 (enduring materials) and type 3 (journal-based articles) AMA PRA Category 1 Credit™. The AMA requires theses types of credits to have self-assessment. Therefore, the ABNM counts these types of credits toward the self-assessment requirement. These credits are automatically recorded as self-assessment through the CME gateway. Does a journal article with CME credit, which does not state it provides SA-CME credit, count as SA-CME? Yes, a journal article that provides Category 1 CME credit is counted by the ABNM as SA-CME. “Self-assessment CME (SA-CME)” is a term used by the ABNM and ABR. Most medical journals will not use this terminology. Do I have to participate in MOC if I am in training? MOC fees and CME requirements will be waived for diplomates who are still in training. Diplomates must provide the ABNM with an annual confirmation letter from their Program Director confirming the diplomate is enrolled during the current year. Fees: After receipt/review/approval of program director letter, fees will be waived for current year. Once training is complete, the fees will be reinstated. Refund Of Fees Paid: If fees were paid while diplomate in training and waiver is granted, the fees will be refunded and reinstated upon completion of the training. CMEs: The CME requirement will also be waived while the resident is in an approved ACGME residency program. The CMEs will be prorated if the resident completes the program before December 31 of the final training year. Waiver: The MOC CME requirements will also be waived while you are in a training program. Upon completion of your training, you will be required to complete the ABNM CME credits for that year, prorated for the time you were in training. For example, if you complete your training on June 30th, you will be required to complete ½ the ABNM credits (4 nuclear medicine credits from Nuclear Medicine self assessment modules, 8.75 category 1 CME (related to Nuclear Medicine) including the SAM credits and 12.5 category 1 CME credits including the credits related to Nuclear Medicine). Do I have to be clinically active? No. If you currently have no clinical responsibility, send a letter annually to the ABNM office stating that you have no clinical responsibility. Part 4 will be waived. You must still participate in Parts 1, 2, and 3. How do I find a document? If you cannot find a document in the menu, try the Search widget at the right. Other places to look are the Documents page and the Sitemap. 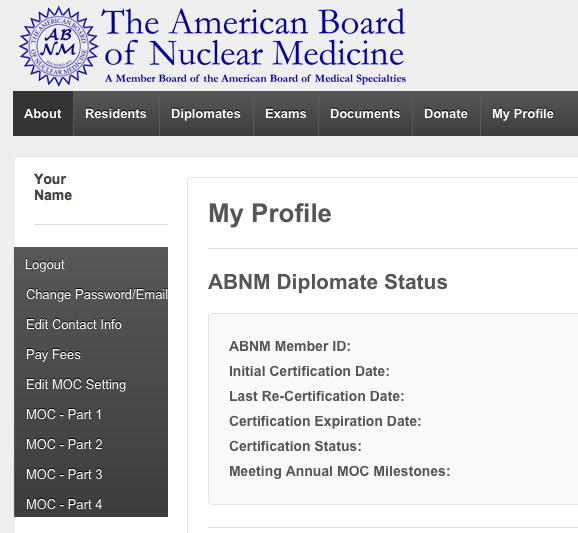 The ABNM has created a portal, My Profile, on the ABNM website for diplomates to track their MOC requirements. The following sections answer questions diplomates may have about the portal. How do I Access My Profile? You can login using the login widget on the right side of most web pages. After successful login you will be taken to My Profile. You may also select My Profile anytime you are logged in. Clicking “My Profile” on the top menu, before you login, will take you to a login page. If you are an ABNM diplomate, the top portion of the My Profile page will look like the following. The information on this page summarizes you MOC status. How do I navigate through My Profile? Use the menu on the left side to navigate through the sections of my profile. Why aren’t the changes I made saved? Depending on the page, you need to click either a Save, Submit, or Add button at the bottom of a page to record changes. How often do I need to update My Profile? You should update all parts of My Profile including your contact information at least once a year. You should pay you MOC fee when you receive the yearly invoice. How do I pay my MOC fee? If you click “Pay Fees” on the My Profile section, you will see a list of outstanding invoices. Click on the invoice and you will be given the option of paying by credit card (Visa, MasterCard, or Discover) or pay by check. There has been no change in my Licenses. Why do I need to update Part 1? You need to verify about your NRC authorized user status, medical license(s), and current work experience at least annually. Click on MOC-1 verify all opt the question. Make sure to click submit at the bottom of the page. Self-assessment credits are included in the nuclear medicine related requirement. 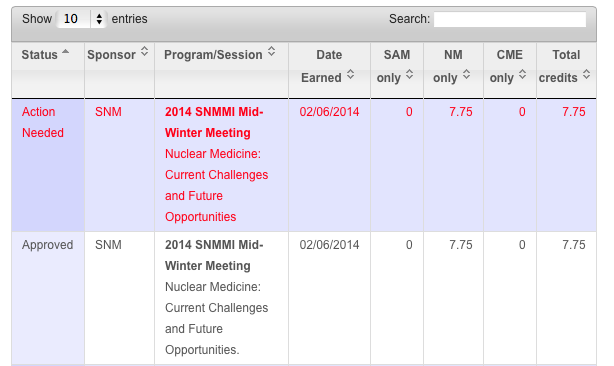 If you have more than 8 self-assessment credits, you need fewer non-self-assessement nuclear medicine CME credits. 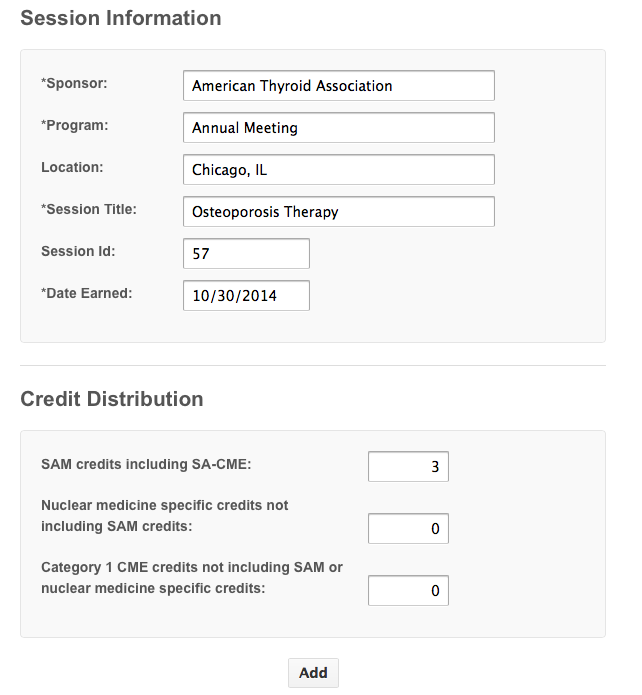 Similarly self-assessment and nuclear medicine CME credits are counted towards your the total CME credits. If you have more than 17.5 credits related to nuclear medicine, you need fewer non-nuclear medicine credits. Please note: Because of the importance of correlative imaging and understanding the clinical impact of imaging on patient management, most CME credits will be considered to be related to nuclear medicine. Do I have to enter Category 1 CME credits manually? 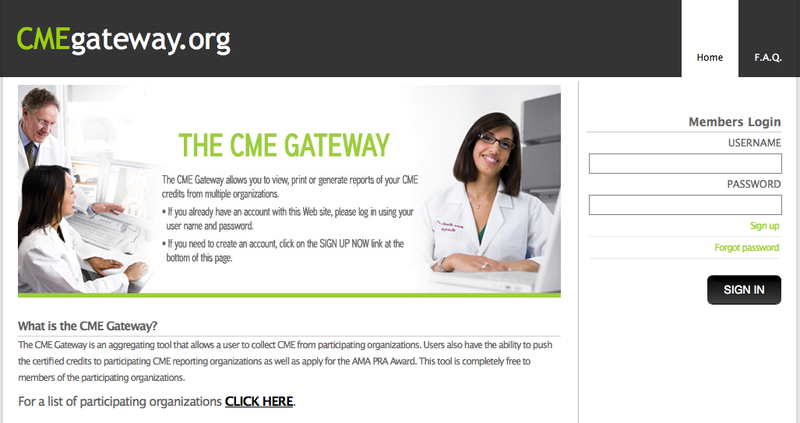 If you have opted into the CMEgateway (see below) your credits from organizations that you are a member (such as the SNMMI, RSNA, ACR, ARRS, and AAPM) will automatically be downloaded to your profile. For this to happen, you need to register at the CMEgateway (www.CMEgateway.org) and establish links to the professional organizations that you belong and earn CME credit. There are two advantages to using CMEgateway. 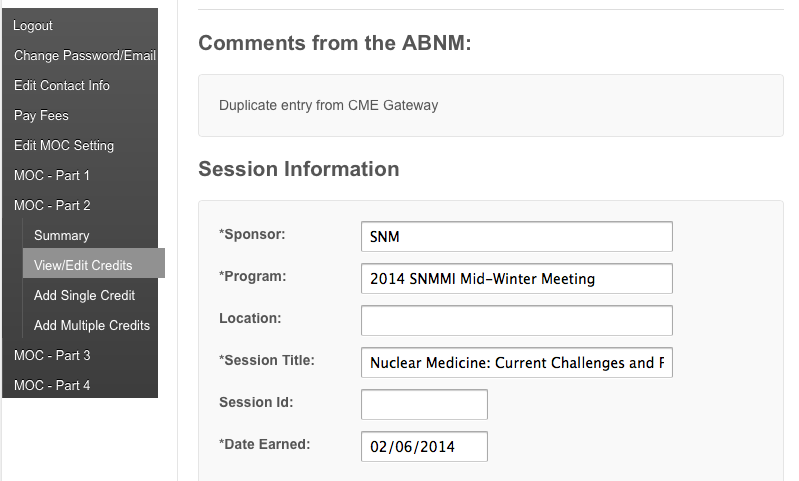 First, you save time since your CME credits are automatically reported to ABNM on your behalf. Second, since these CME credits have been verified, they are not subject to audit. I do not belong to the society where I earned the CME credit; will my credits transfer through the CMEgateway? You must belong to the society to receive this benefit. You will have to manually enter those credits in your My Profile and they will be subject to audit by the ABNM. What happens if the organization I received my CME credits through does not participate in the CMEgateway? You must belong to the society to receive this benefit. You will have to manually enter those credits in your My Profile and they will be subject to audit by the ABNM. How many Category 2 CMEs are required annually? The ABNM no longer requires diplomates to document Category 2 CME credits. Although Category 2 CME activity is a valuable part of MOC, keeping track and recording Category 2 credit is largely busy work. How do I fill in the fields with CME credit information? Since the activity can range from attending grand rounds, on-line educational activities to manuscript reviews, you have some flexibility in entering the activity. If you receive multiple CME credits from a single sponsor, you do not have to enter each CME credit. Instead use the “Add Multiple Credits” option. 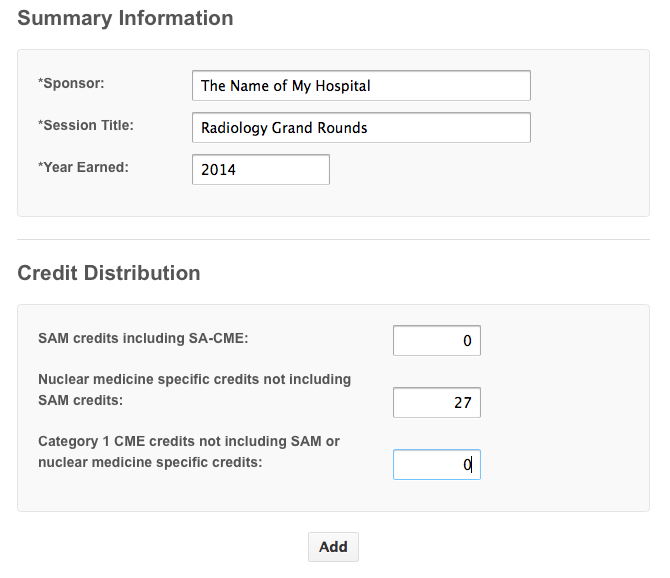 Below is a sample CME summary activity entry for attending Radiology Grand Rounds at your hospital. Make sure to click Add at the bottom of the page to save the information. How do I see how I am doing? The MOC – Part 2 page shows a summary of your cumulative 5-year goal, earned credits, and the gap between your goal and earned credits. Hover over a column to see the exact credit values. 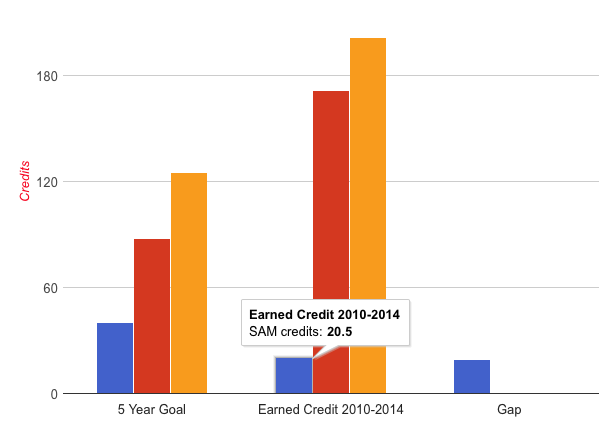 A second graph shows the yearly goal and your yearly-earned credits. Clicking on a bar will take you to “View/Edit Credits” for that year. What numbers do I fill in for the different credit types? 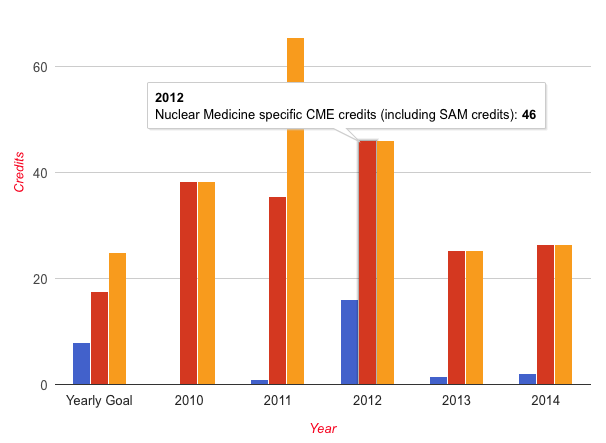 SAM and SA-CME credits count toward the nuclear medicine specific requirement, and SAM, SA-CME, and other nuclear medicine specific credits count toward the overall Category 1 CME requirement. However, when entering nuclear medicine specific requirements on this page do not include SAM or SA-CME credits, and when entering Category 1 CME credits do not include SAM, SA-CME, or nuclear medicine specific credits. Why do I have a duplicate entry of CME credit noted in my record? Sometimes diplomates manually enter credits that are automatically entered through the CMEgateway. Always check for the entries that are automatically approved by the CMEgateway in your profile before you enter new credits. This will eliminate the ABNM contacting you when duplicates are identified (see next). I’ve made an error in entering a CME activity and have been contacted by the ABNM to revise, what should I do? To edit/delete/correct incorrect or duplicate CME credits, go to My Profile and click on MOC – Part 2; then click on View/Edit Credits. The credits that need to be edited will have “action needed” status. The only credits that you may edit have “Submitted” or “Action Needed” status. Credit transferred through the CME Gateway and self-entered credits that have already been approved cannot be edited. Click on “Action Needed” and you will be taken to a page where you can edit the entry. If the entry was a duplicate entry, the click “Delete” at the bottom of the page. Is there another way the ABNM can remind me of the exam deadline? The ABNM sends reminders every other month to diplomates via e-mail regarding a diplomate’s status in all Parts of MOC. Reminders about Part 3 deadlines will be sent 2 years before your certificate expires. Your certificate expiration date will be listed on page 1 of your profile. What happens if I miss the deadline and my certificate expires? You will not be in compliance with the ABNM MOC requirements until you have taken the MOC exam and passed. If you have a time-limited certificate, you will be listed as no longer being certified if you do not pass the MOC exam before your exam deadline. If I miss the deadline will I still be able to take the exam? Yes, the next time it is offered, which is once a year. If your certificate expired longer than 5 years, the MOC Part 3 requirement is to sit for the initial certification exam rather than the MOC exam. Can I take the exam earlier than the required 10 years? Yes, you can take the MOC exam at anytime; however, the certificate will only be valid for a maximum of 12 years after passing the previous exam, regardless when the MOC exam is passed. I have a lifetime certificate, will that certificate still be valid when I pass the MOC exam? Yes, you will always retain your original non-time limited certificate. 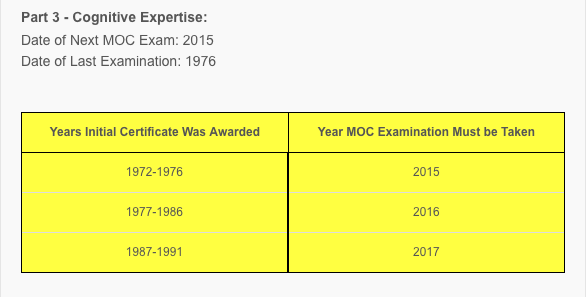 Upon passing the MOC exam, you will receive an additional certificate noting this accomplishment and your participation in MOC. What is the timeline for Part 4 projects? Different timelines for Part 4 projects are show on the PPA Project Timeline document. – Is Your Doctor Certified?